hello the weekend..and to all my bloggings bud's managed to finish my very *less is more* card Lol!!! my friend asked me for a fairly simple 50th Golden Wedding so here it is and i had to hold back with the flowers heheh...but just hope she likes it i have yet to do the inside but it will i hope coordinate with the front i used the easel design with cut out corners form my martha stuart punch gold ribbon and two flowers ..YES TWO only flowers glued onto two other broken embellies cut out nesties in gold card stock and there you have it oh not forgeting my hand tied bow it just wouldnt be a *sassy card* unless it had my bow..off to make the box now..hope you all have a fabby lovely weekend..hubbies off so hopeful we will get out and about wonder if i can persuade him to take me to a nice..er a crafty place...thanks again for all the lovely comments on my 2year old birthday and of course my other work the great grandparent were over the moon aw shuck;s!!!!!! and she has asked me for another for another grandaughter whos one....so great big sassy hugs im also entering it into http://lollipopcrafts.blogspot.com/ anything goes and http://charismacardz.blogspot.com/.xxxxxxxxxxxxxxxxxxxxx. Simple but stunning Sassy in fact I'd say elegant. I'm sure your friend will agree. 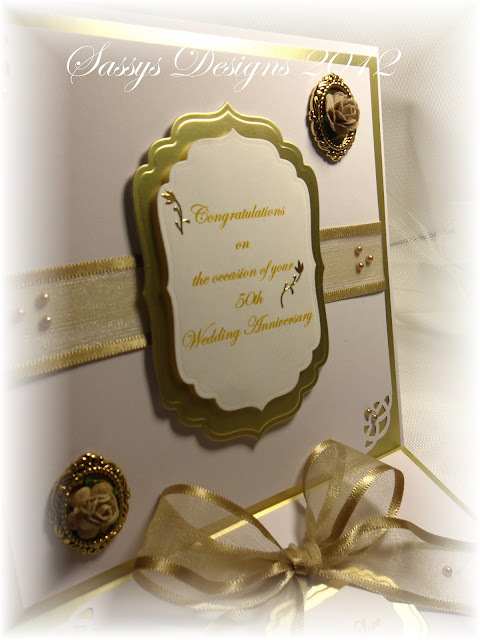 Beautiful card, so elegant. Thanks for joining us at Charisma Cardz this week! 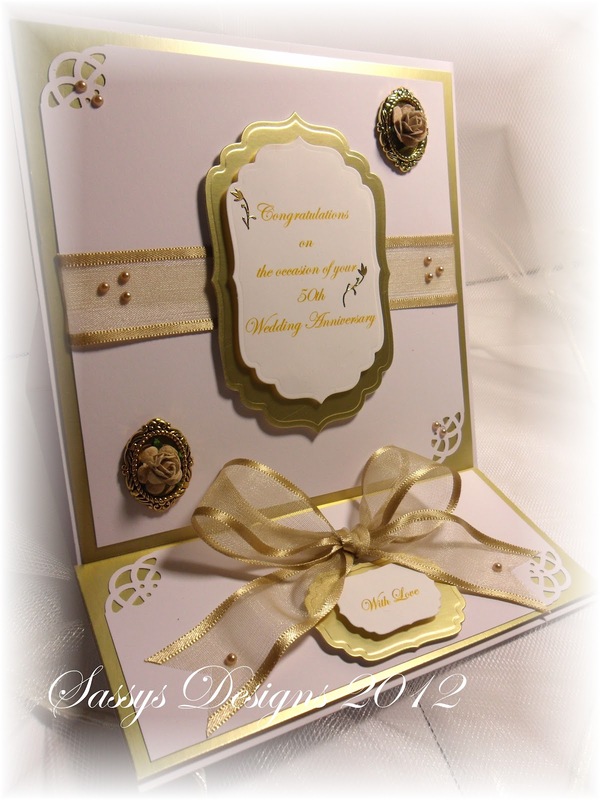 Your card is beautiful and stunning with with a gorgeous bow - perfect. It may not be OTT Sassy style, but it's still oh so classy! Gorgeous well planed creation very classy creation.